Tired of stodgy corporate games made by The Man and his minions? We're playing the 31 best indie games for a change of pace —- and so we can judge them. Today, Shank. 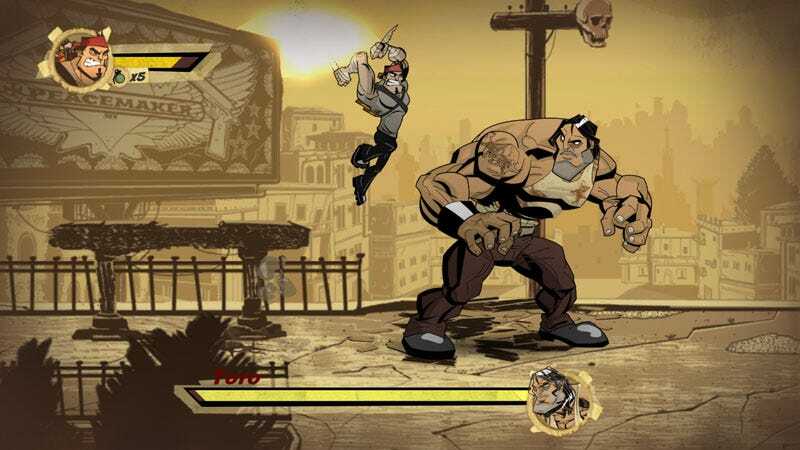 Shank is a fresh new take on the side-scrolling beat-em up, combining a gritty, Spaghetti Western meets animated graphic novel look and feel with a fluid combat system so easy to pick up that even the most hopeless button masher can pull of spectacular combo moves. Klei Entertainment is a studio that subscribes to the "when it's done" method of announcing game release dates. A playable demo is making the rounds, and should be available at the Independent Games Festival in March, where players can see for themselves why it received a nod for Excellence in Visual Art. With art direction from Atomic Betty director Jeffrey Agala, it's no wonder that Shank was nominated for an Excellence in Visual Art award. From the buff, square-jawed protagonist to its lowliest cannon fodder enemies, the game oozes with character. The comic book panel cutscenes are impressive enough, but the game truly shines once it's in motion, with animation so fluid you'll think you're watching a cartoon. But participating is so much better than watching, and the combo attack system in Shank is gloriously simple. There's a button for each weapon in Shank's arsenal - knives, pistols, shotguns, and special weapons like grenades and a chainsaw. The character switches between implements of destruction seamlessly, which makes for plenty of spectacular "I meant to do that" moments. It's the most fun I've had moving left to right in ages. Jamie Cheng, Klei Entertainment: I think it was one of those paper-napkin kind of moments. Jeff (Agala, Creative Director) and I came up with the idea as we were discussing what we loved about games of the past, and it dawned on us that we could make a fantastic Double Dragon. More than that, we could take it to crazy levels with animators like Aaron (Bouthillier, Lead Animator), and direct the kind of story that we would love to experience ourselves. From there, the metaphoric dam broke, and inspiration from the amazing controls of "Prince of Persia," to great story tellers like Tarantino, to fantastic art from "The Preacher" all came forth. My wife rolls her eyes as I continue to purchase games, movies, and graphic novels in the name of "research". Cheng: Maybe it has something to do with using both sides of the brain. I'm a programmer by trade, and I absolutely love it. That brought me down the road first to being a web-designer, which I hated, then to being a game developer, which I couldn't get enough of. On a side note, I think I would also have loved being a graphic novelist or a film director. But, if I went down one of those paths, would I be in a position today where I'm creating the work I love and being paid decently for it? Probably not. Pixar for their masterful storytelling and amazing ability to create worlds that are always surprising and wonderful. Bioware for the clarity of their vision and the quality of their games. Quentin Tarantino for his passion and the way his movies take influences from a crazy depth of knowledge and create something new. "Zelda: the Minish Cap" for the tightness in the design.